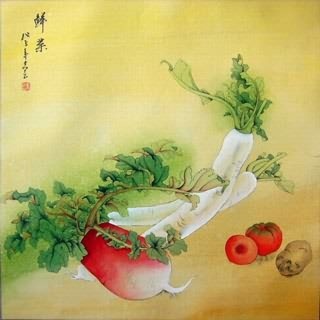 Chinese vegetables paintings include Calabash/cucurbit/bottle gourd painting, Luffa/loofah painting and Pumpkin painting, etc. 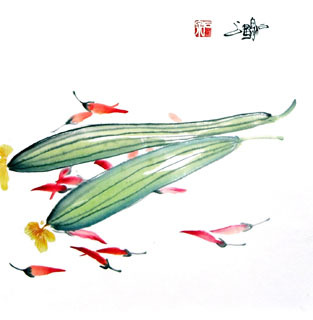 Chinese Calabash /cucurbit/bottle gourd Fengshui Painting: Calabash is called "hu lu(葫芦)" in Chinese, which sounds like "fu lu(福禄)", so it symbolizes felicity and emolument. Its stem is called "man(蔓)" in Chinese, which sounds like the word "wan(万)", so it symbolizes ten thousands of generations. Besides, a calabash has a large number of seeds in it, so the whole plant is an auspicious symbol of prolific offspring. In Chinese folk culture, calabash is believed to have the function of repeling evil spirits. As its S-shaped appearance is similar to the S-shaped line seperating the yin and yang area of the Taiji("great ultimate") symbol, calabash was thought to have magic power in ancient China, and many people would hang a calabash over their door. 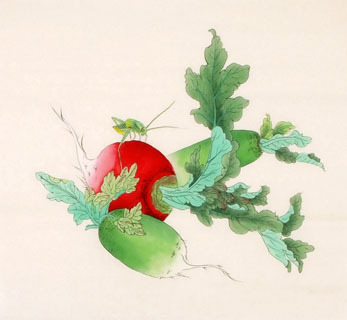 Zi Sun Wan Dai(子孙万代)/ Zi Sun Hu Lu(子孙葫芦): Calabash and its leaf,stem painting. This combination symbolizes prolific offspring and happy family. 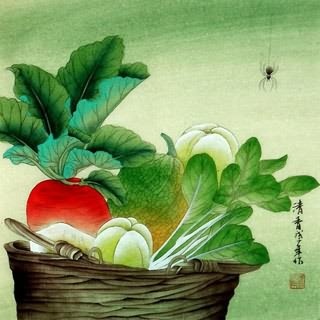 Wan Dai Chang Chun(万代长春): Calabash and Catharanthus roseus painting (Madagascar Periwinkle). Calabash represents all generations. Catharanthus roseus is called "chang chun hua" in Chinese, "chang chun" means "remaining youthful vitality". So this combination symbolizes "all generations of your family remain youthful forever". 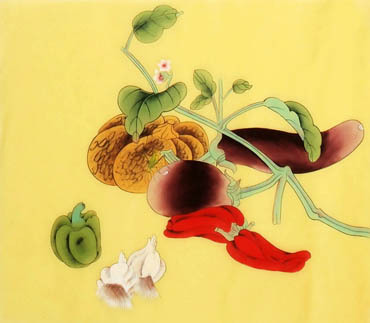 Bi Xie Jin Bao(辟邪进宝): Calabash and conch shell/sea snail painting. Conch shell is one of the Eight Treasures in Buddism, and both calabash and conch shell can keep the treasures in them and never let them go, so this combination can repel evil spirits and bring in treasures. They also can help to improve the relation between a couple. 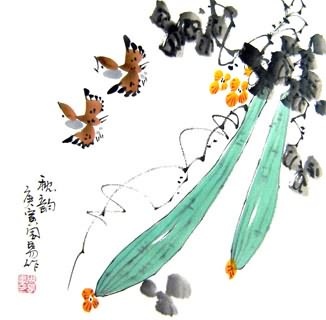 Chinese Luffa/loofah Feng Shui Painting: Luffa has long cirrus and strong roots, and the first Chinese character of luffa is "si(丝)" which sounds the same as that of "miss/yearn(思)". So it represents "Endless yearning", and it also symbolizes safeness, auspiciousness and happiness. 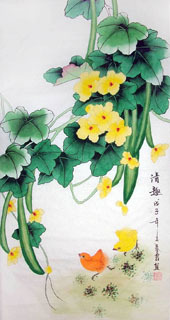 Gua Die Mian Mian(瓜瓞绵绵): Luffa and butterfly painting. Luffa is very small when it is just growing, and then much bigger. 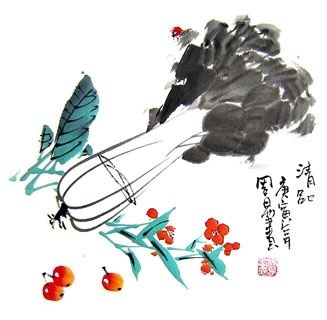 The second Chinese character of butterfly is "die(蝶)" which sounds the same as that of "small melon(瓞)". So this combination symbolizes prolific offspring. 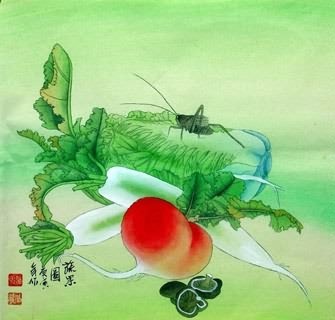 Tian Di Chang Chun(天地长春): Small luffa, nandina and Catharanthus roseus(Madagascar Periwinkle) painting. The first Chinese character of nandina is "tian(天)", and the second character is "zhu(竹)" which sounds like "wish(祝)". Small luffa represents prolific offspring. Catharanthus roseus is called "chang chun hua" in Chinese, "chang chun" means "remaining youthful vitality". 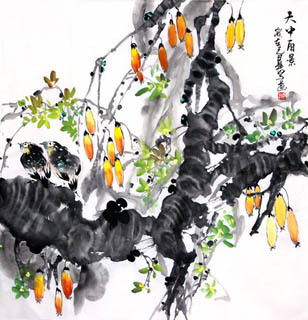 So the whole combination constitute the phrase "tian di chang chun", and it symbolizes "remaining youthful vitality and good fortune forever". 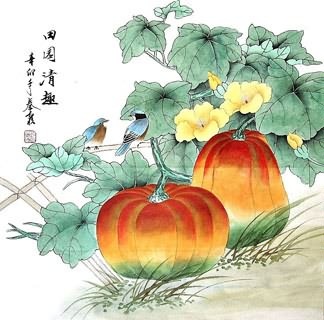 Chinese Pumpkin Fengshui Painting: Pumpkin is called "nan gua(南瓜)" in Chinese, so it represents the phrase "shou bi nan shan(寿比南山)", which is a famous birthday blessing and means "may you live a long and happy life". A pumpkin has a large number of seeds in it, so it also symbolizes fertility. 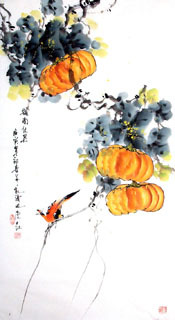 Jia He Wan Shi Xing(家和万事兴): Two(2) pumpkins and a mantis painting. Two pumpkins represents the brothers or a couple living in harmony. 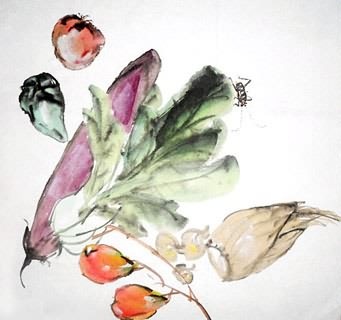 The mantis represents vitality and flourish. So this combination means "A happy family means wealth and will prosper". 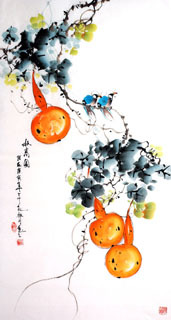 Auspicious birthday blessing(福如东海，寿比南山): A bat on a pumpkin with some auspicious patterns around it. 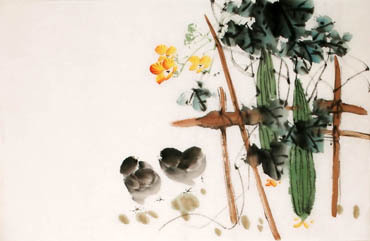 In Chinese, bat is called "bian fu(蝙蝠)" which has the character "fu". It sounds the same as that of "happiness(福)". So this combination constitute the most auspicious phrase for birthday blessing, and it expresses the wish for a long and happy life. 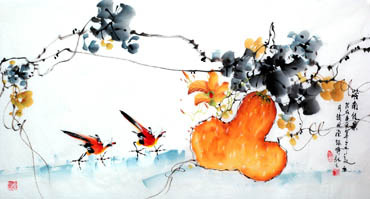 Fu Zhi Xin Ling(福至心灵): Pumpkin, peach, ganoderma and bat painting. Sometimes the combination include Chinese ancient coins or shoe-shaped gold/silver ingot. This combination symbolizes " The mind becomes intelligent at the approach of happiness". 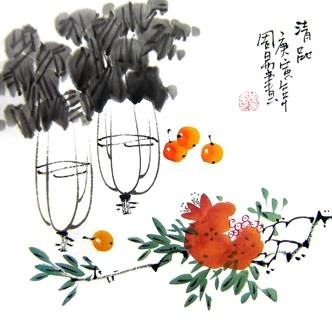 Tian Chang Di Jiu(天长地久): Pumpkin and nandina painting. This combination symbolizes "The friendship will be everlasting and unchanging" or "May your family is full of love and happiness forever". InkDance Price: USD 319 /GBP 262 /EUR 304 Sold, you can customize it.